Bottle of Northumbrian Passion Goes Up For Auction! We are gearing up for an official presentation of our special ‘Northumbie Awards 2018’ with a very quirky initiative that should everyone talking. In the meantime, we’ve got some fabulous news, having scooped a prestigious award for last year’s Northumberland Day PR campaign! Catapult PR has been awarded the 2018 Chartered Institute of Public Relations (CIPR) Excellence Award for ‘Best Travel, Leisure or Tourism’ Campaign’ in a category in which it was up against campaigns conducted for EasyJet, Holidays.com, Virgin Holidays, the National Trust and Legoland. The 2017 campaign saw Catapult launch the inaugural Northumberland Day, establishing the brand and creating elements behind it, such as the quirky Northumbies, the World’s Biggest Stottie and the Northumberland Flag Challenge. It has built on this in 2018, launching this year’s programme by taking a heart of red and yellow flowers out to Longstone Island in the Farne Islands, to commemorate the 180th anniversary of Grace Darling’s heroic sea rescue. 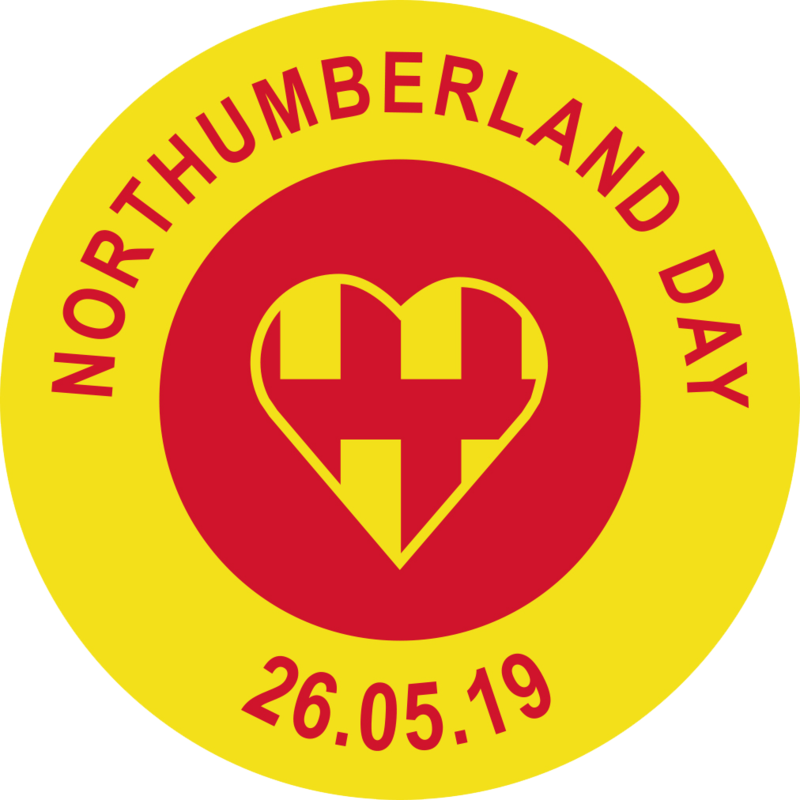 Now, we are preparing to hand out this year’s Northumbies to passionate participants, who made Northumberland Day 2018 super-special, turning it red and yellow with flags and bunting and creating special events to communicate pride in the county. The Northumbie Awards are handmade by our fabulous local glass artist, Helen Grierson, and depict elements of Northumbrian life. There are seven Northumbies currently up for grabs, but we need sponsorship for at least one more award, and some runners-up trophies, before the official presentation on July 5. To achieve this, we are auctioning off a very treasured possession – a specially bottled vintage of ‘Northumbrian Passion’, now to be found on Ebay. The passion was captured inside the bottle at various events around the county, in the days leading up to Northumberland Day and on the day itself, being quickly corked each time and retained within the curvaceous and much-to-be-desired bottle. 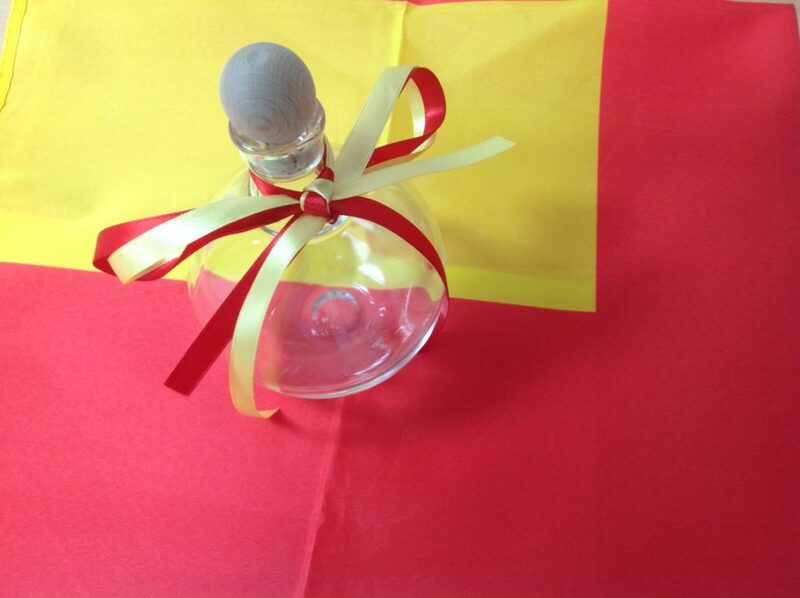 This special bottle will be presented to the winner of the auction, at the Northumberland Day awards night being staged at Langley Castle on the evening of July 5. Although passionate businesses – Newcastle International Airport, The Angel of Corbridge, Hexhamshire Brewery, Justbookitnow.com, Langley Castle, Helen Grierson Glass Studio and ourselves – have stepped up to be a sponsor, a few more would make a huge difference to those who put in so much effort when demonstrating their love of Northumberland. We really hope Northumberland businesses will put in some decent bids, as they seek to become the owners of something completely unique and quirky. Winning the auction for the bottle of ‘Northumberland Passion’ should provide lots of great publicity. At the same time, we are offering the opportunity for one child to become an award presenter on the night, at Langley Castle. To put your child forward, send details of why they would make an great presenter to NDay@catapultpr.co.uk by midnight on June 20. Talking about the initiatives, Jane Hunt, organiser of Northumberland Day, says: “Our bottle of Northumbrian Passion really is a money-cannot-buy item. Nobody else in the world has something as precious as this and it would create a massive talking point in the boardroom of any business that takes corporate social responsibility seriously and wishes to demonstrate its support for Northumberland at a grass-roots level. Anyone wishing to put in a bid for the bottle of Northumberland Passion can go to https://www.ebay.co.uk/itm/323302428357?ssPageName=STRK:MESELX:IT&_trksid=p3984.m1558.l2649 where they will find the bottle. Money raised will be put towards more awards and, dependent on the amount, possibly also initiatives for 2019.